If you click the button “Glass Statics” on the main menu of the structural analysis module you will be forwarded to the input form of the corresponding function. 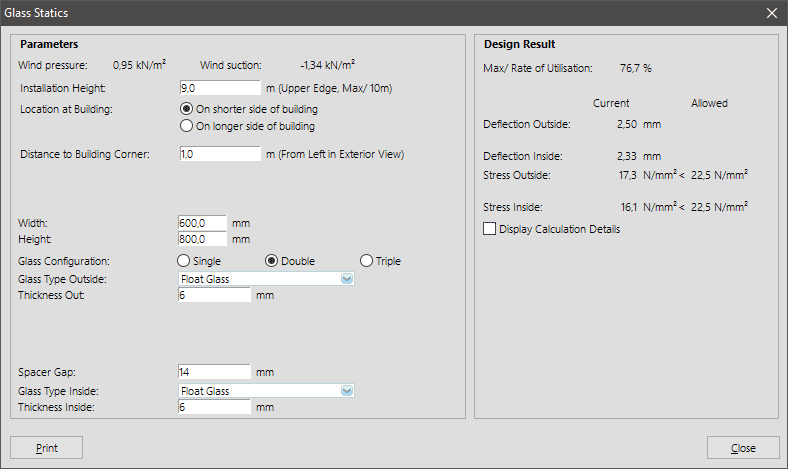 After having determined the glass pane’s position on the building the program already displays the corresponding wind pressure and wind suction loads. 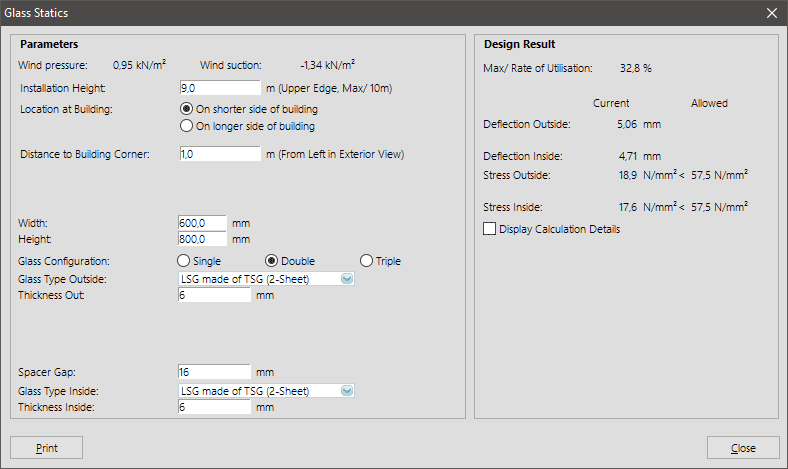 Then enter the pane dimensions and select glass type, pane thickness and spacer gap if applicable. 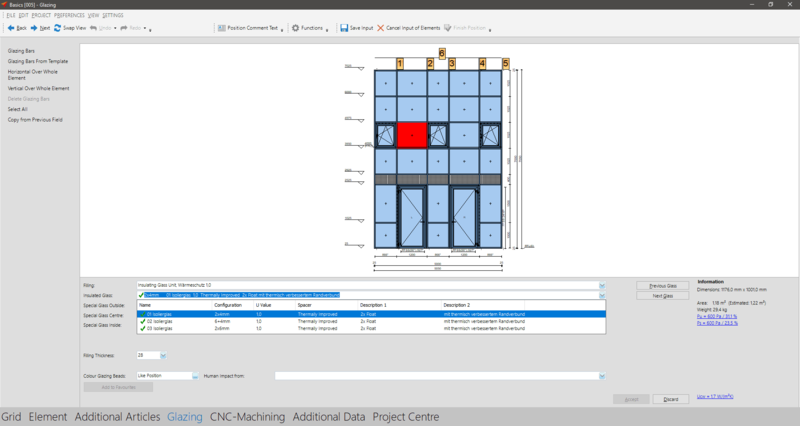 Under the paragraph “Calculation” on the right hand side of this form you are able to check if your glass configuration keeps your self-defined limit values. Examples of different glass configurations are displayed below. There is no deflection limit for vertical glazing specified in the Technical Regulations for the Use of Glazing with Linear Supports (TRLV). Only stress limits are available. However, it is required to consider climatic actions on insulated glass units which may represent a multiple of the wind actions. Deflection is the decisive design parameter in most practical cases. However, LogiKal®does not suggest any standard deflection limits for the glass field. 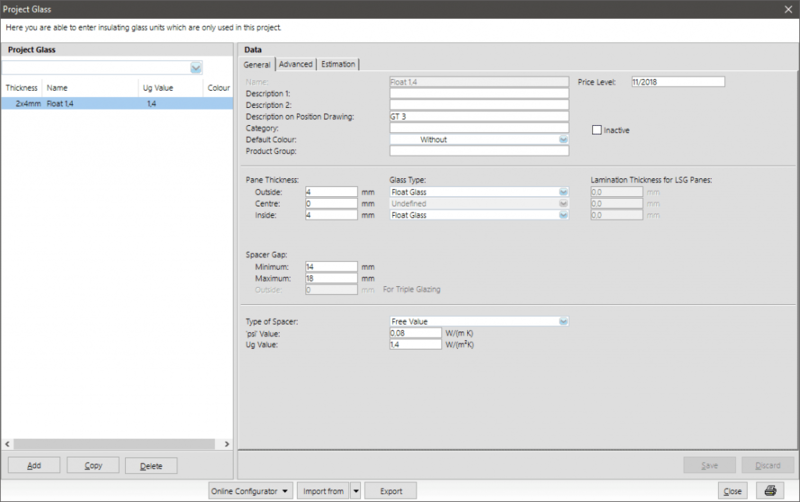 Each user may set-up common limit values like for instance 8mm or L/300, but in particular cases it is absolutely essential to enquire specific values from the glass manufacturer. Example: A glass pane 1000x1000mm has a maximum permissible deflection of 1000/300 = 3,3mm. A current deflection of e.g. 3,63mm already exceeds the limit value by 10 percent even though the value of 8mm is only utilised by 45 percent. Therefore please check if both limit values must be kept or if e.g. 8mm are sufficient. In this case you may reset Maximum Deflection / Length Glass Edge to Unlimited. Besides the applied proof is a so called proof of serviceability. I.e. keeping the limit values provides that the calculated glass pane is fully functional in matters of impermeability and resistance. This means in practice that the maximum load bearing capacity is usually not reached by far even though the serviceability is no longer proven. If the structural analysis module reports a glass excess deflection you cannot always conclude that the glass mustn’t be applied that way. However, you should definitely consult your glass manufacturer in such a case. In the glass input form LogiKal® displays directly which glass panes keep or don’t keep the limit values. However it is essential that glass types are assigned to the selected glass. The following two pictures show where to determine the glass types for an insulated glass unit (“User Database” -> “Fillings” -> “Glass Units”) and project glass. 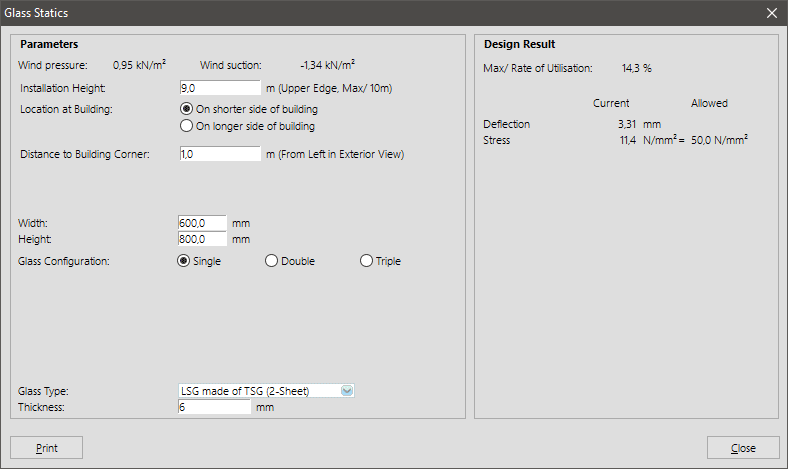 It is usually easier to enter a glass in the independent statics module and to configure a structurally sufficient glass (glass type, thickness, spacer gap) there. Then you can either input this glass as glass unit or single glass in the “User Database” or enter it as project glass during input of elements.